Health & Fitness Tips for 2014! Happy New Year everyone! This always seems to be the time for ‘out with the old and in with the new’…new goals, new changes, making new habits and breaking old ones. Though I strongly believe there’s no better time than the present to set goals and reach them, I’m always happy to see new faces at the gym trying to make changes in their life at the start of a new year. What I don’t love to see is those faces disappearing after a month or two because they didn’t get the results they wanted as quickly as they thought they would. Remember, weight gain doesn’t happen overnight…for most, it has probably taken months or even years. Weight loss works the same way. It’s not a quick fix and it takes time, conscious thinking and energy to see the results you want. So buckle up and get ready for the long journey ahead…it won’t be easy but you will be so happy you stuck with it and made changes that will affect you for the rest of your life. I guess I would like to start off 2014 with a few tips to help you stay on track for the long haul. I am just like everyone else…the holidays come, the parties start and the cookies are constantly tempting me. I am ready to start the year off on the right foot and not allow these unusual habits in my life to continue. Here are some of the things that have helped me along the way with setting new goals and getting motivated again. 1. Set both short term AND long term goals. I find it easiest to stay in the present moment. Weekly goal setting is very important. There is never a week that goes by that I don’t know what I’m going to be doing when…workouts included. If I set ‘appointments’ for everywhere I have to be during the week, I’m more likely to go because I do what I say I’m going to do when I say I’m going to do it. Plan ahead for yourself. Figure out what works for you and your schedule and be realistic about it. I have come to learn that there is always time in your life for the things you want to make time for. If the gym is somewhere you want to be at some point during each day, then figure out when that is and make it happen. Long term goals are the prize. The weekly goal setting helps you keep your eye on that prize. Make sure you know exactly what you want out of all your hard work. Goals are made without worrying about being judged by someone else because they are your own. You are the only one that can live the life you want. Sit down and take time to figure out what kind of life that ideally is. It’s an exciting process and I highly recommend writing these goals down and showing them to your biggest support systems. They will help give you an extra push to stay on track and cheer you on along the way. 2. Tackle one eating habit you’d like to change at a time. If you don’t hydrate yourself enough, work on getting more water in one week. Do you have trouble with too much snacking? After getting on track with drinking more water, try to incorporate snacking less throughout the day. Are you a carb or sugar junkie? Hydrate, snack less and try to fill up on good carbs and less sugar. It’s really easy to get overwhelmed by all the changes you need to make with your eating habits. There’s no point in trying to take them all on at once knowing full well you’re not going to be able to be successful with each one at the same time. This is a process remember? Make eating changes that are going to last a lifetime not just be a temporary fix. What’s the point of eating a certain way knowing full well this is not a forever way of life. With that said remember there are always going to be holiday parties and birthday parties to pull you away from the proper eating habits you’ve grown accustom to…that is okay. If you have the proper groundwork in place already, those days aren’t going to phase you long term. 3. Variety is a good friend to have. No one wants to be a one trick pony. It is great to try and do a lot of different things to keep your body guessing. Throughout my week there are at least four different kinds of workouts I enjoy. Weight lifting, boxing and kickboxing, yoga and usually some kind of pilates or barre class. I love being able to switch things up and have new activities to do each day. The same old routine will become just that…old. Find activities you enjoy and find a way to incorporate them into your week. 4. Find accountability. Whether it may be a personal trainer or a workout buddy, do what you have to do in order to keep yourself on track. I am a personal trainer and I have personal trainers that I work with each week to keep me going. I always used to think that personal trainers were a luxury when in fact, they are an investment that are worth far more than the money you spend to see them each week. I find them motivating, inspiring and they always push me outside of my comfort zone. I would not be where I am today without them. I also have workout buddies that I love to sweat with…it’s fun, gives me one more reason to show up and make the commitment and it’s pretty cool to have people in your life that are after the same things. I can’t wait to start this new year off with a bang. I’m going to bring the workouts, the recipes and the fun to help you with your goals and aspirations. I can’t wait to see what the year has in store for me…time to work hard, play hard and continue to grow into the person I want to be. I’ll leave you with you one of my favorite quotes from one of my favorite movies… ‘It’s supposed to be hard, if it wasn’t hard everyone would do it, the hard is what makes it great.’ It’s not always going to be easy but the hard will be what makes it all worth it in the end. Posted on January 9, 2014 January 9, 2014 Categories Ashley, Fitness, NutritionLeave a comment on Health & Fitness Tips for 2014! I know I have done a flexibility post before but it is just so important that I’m going to bring it again. This time I’m going to incorporate some props you can use to help deepen some basic stretches without needing a stretching buddy. All you need is a towel, a belt or if you have a yoga strap laying around that would be ideal. Don’t go out and buy anything special as it’s easy to improvise and just use something lying around the house. I am going to use a towel and show you some great stretches to increase flexibility. The first stretch is your basic hamstring stretch. Place the towel around the ball of one foot. Laying on your back with the other leg straight out, pull up on the foot with the towel making your leg go perpendicular with your body. As you slowly pull your leg towards you remember to keep your other leg as straight as possible. The goal is to get your leg straight so if you need to release the leg down a little bit that is just fine. Push through the ball of your foot at the same time as you pulling forward and hold the stretch. Breathe through it and hold for at least fifteen second. Place the towel in your right hand. Keep your other leg straight still and gently lower your straight leg down to the right side. Your toes should be pointing up towards the ceiling and your opposite shoulder should be pushing down towards the ground to keep your back flat. You will feel this stretch in your groin, inner thigh and possibly behind the knee and/or in your hip depending on your hip flexibility. legs straight, gently lower your right leg across your body to towards the floor. Keep your right shoulder pressed to the ground to give you a good lower back stretch. 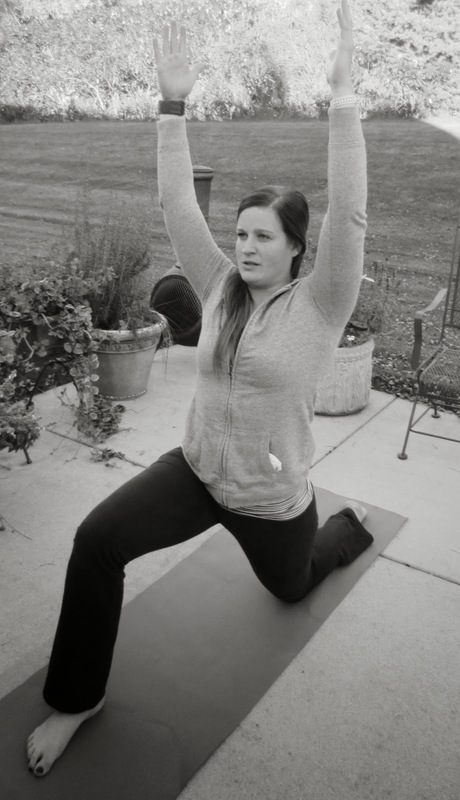 To add some variety to this position, you can bend your knee to a 90 degree angle to deepen the stretch in the back. 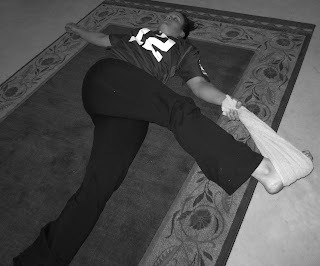 The last stretch you will be on your stomach, the towel or strap will be placed across the toe of your right foot. Bend your knee, bringing your heel to your glute. To deepen the stretch, try to gently lift your knee with the towel off the ground. This stretch will be felt in primarily the quad muscle. It’s very important to properly fuel your body before every workout. Almost all cases when a client starts to feels nauseous or light headed during a session came down to the simple fact that they didn’t eat anything or they didn’t eat enough to get them through the workout. Once they feel better, they usually admit to the fact that they didn’t want to feel sick from eating too much so they didn’t eat anything. With that said, it is important to try to eat 30 minutes to an hour before your workout. There is a range for this because every body is different. Some feel sick if they eat too close to workouts and others can eat right before they start and not be effected by it at all. A good rule of thumb is it is always better to eat something rather than nothing. Not eating enough can affect the intensity and duration of your workout as well as how much energy you sustain throughout. So here is a list of ideas for pre workout snacks. They are all easy to prepare and they will give you just what you need to work hard and feel energized the whole time. It is also important to eat foods that are easy for the body to digest. Depending on how long your workout is, you may need to eat another small snack, especially endurance workouts such as running. Today was the day for me to finally run my 10k. I must say it was a strange experience to run a race that I actually trained for. Usually I just wake up and run it and then I’m sore for the next week because I shocked my body and it got mad at me. It was a good feeling to actually feel prepared. I was able to set some expectations for myself on how I wanted to do based on how my training leading up to it went. I think goal setting is essential for success. I have learned a lot about myself just by deciding to try running outside for 30 days. Obviously I didn’t run everyday but I averaged about three days a week. I would have never been able to run what I did today at the pace that I did without that initial goal in mind and the execution of my plan. I found that my weekly goals were just as important in my success as signing up for the race itself. I really don’t mind running after all, I would’ve never thought that. I learned to give things a try more than once (the only thing I admittedly will never try again is hot yoga) and allow my body to get used to it before I give up and quit. My body learned to endure through the hot and the cold, the long and the short distances. I’m glad it is over but the journey to the finish line paid off and I’m proud of myself. Think about your workout routine. Do you feel like you get everything out of it that you want to? Is it fun or over time do you get bored with it? Do you set small goals for yourself or do you find yourself always just after a large long term goal? I ask you these questions because sometimes I feel like people go through the motions. They show up at the gym and think that’s enough. If you are going to invest your time at the gym, it’s important to know what you want out of it and work hard towards obtaining that. You should be feel like you got what you wanted out of your workout. I find that even though I don’t sweat as much during a tough yoga class, stretching and flexibility for me is a different kind of hard. I have a goal in mind for each workout. For yoga, at the end of class I want to feel more flexible, relaxed and refreshed. It’s important to have those thoughts in my mind otherwise I would think I didn’t do enough. In reality, flexibility is just as important for my body as getting my heart rate up. If you’re bored at the gym, try something new. You never know if you like something if you never give it a try. We are creatures of habit and sometimes become content with what we are doing because it’s easy and familiar. Last week I tried a barre class. I thought I would need a tutu and we would be working on stretching and plies and a lot of ballet inspired moves. I was completely surprised at how much I liked class and how many ballet moves we didn’t do. My abdominals were contracted almost the entire class. My muscles were worked in a completely different way than I would normally work them but the burn was the same, if not more intense than it usually is. I was apprehensive to try it and so happy I did in the end. It’s another thing to add to my list of activities I want to incorporate into my weekly schedule now and all it took was for me to take a step outside my comfort zone. Small goals and small successes are the stepping stones to getting to your ultimate goal. Whether it be losing a pound a week or being able to run for fifteen minutes straight, it doesn’t matter as long as you always have something to work towards. Those small goals will help you get to your 30 pound weight loss goal or your half marathon. I like to feel some sort of success every week and I think everyone should. It gives you the push to keep on keeping on. So this week take a good look at what you’re doing and set a goal for yourself. Try something new. Allow yourself to find success somehow on a small scale. Embrace your body and listen to it. You only get one after all. When it comes to exercise, I have always been open to trying new things and switching my workout up depending on what I think my body needs or the goals that I want to accomplish. Back in July, I decided I wanted to give running outdoors a try. Well, I am happy to report that outdoor running has become something I really enjoy…most days at least. I used to be a treadmill runner and now I find it much more difficult and quite frankly, just plain boring. I can honestly say I am surprised that I stuck with my training and I’m all signed up for a 10k in a couple weeks that I will be completely prepared for. I would’ve never come to this conclusion if I didn’t give something I thought I would absolutely hate a chance. The reason I am bringing this back up is because I have decided to give another form of exercise a try…again. A while back, I tried out a yoga class. It was okay and I tolerated it but I never felt like I was getting a good workout from it. Most of the time, I’m completely wiped out and sweaty after a workout. I think because of my athletic background, I’ve always been a high intensity exerciser. It is hard for me to turn off my thoughts and take the time to let my body rest, stretch and recover. Well I have come to the realization that rest is just as important sometimes as working out. That’s where yoga has come back in. It is a time I can deload, let go of my thoughts and just enjoy the quiet for an hour. It also allows me to get in the stretching my body desperately needs. It compliments my workout regimen perfectly and I plan on incorporating it in my weekly routine once or twice a week. It will help my running, eliminate some of my soreness because my muscles will be more flexible and can endure more and it will also increase my balance. I am excited to have found another new thing to try and yet another goal to work towards. Here are a few basic poses I have found beneficial to me. Cat/Cow: these are great back stretching exercises. 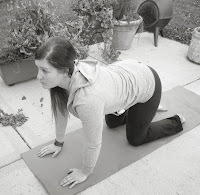 Cat: Start in a four point kneeling position with hands shoulder width apart and stacked below your shoulders and knees hip width apart stacked below your hips. 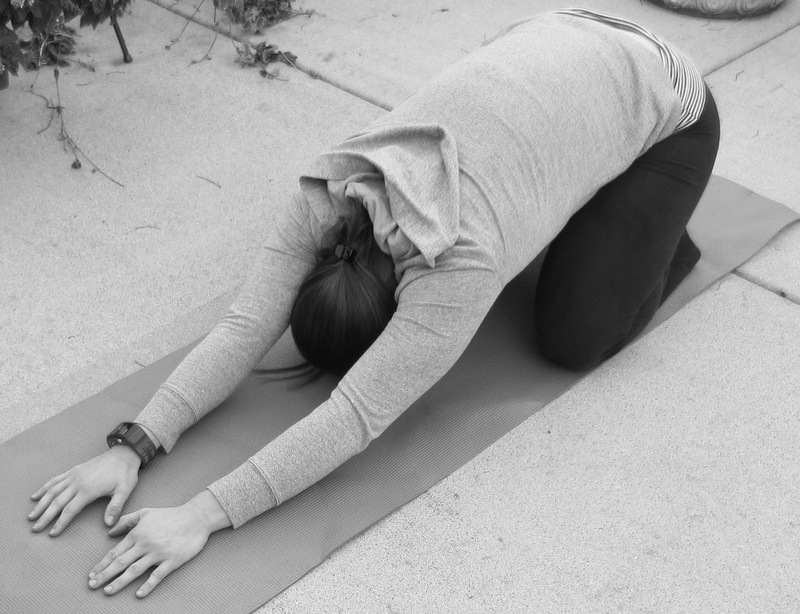 As you exhale, arch your back and drop your chin toward your chest. Cow: You will switch back and forth between cat and cow. After the exhale of cat pose, you will inhale into cow pose. Hollow out your back, keep your abdominals contracted but your core should lower towards the ground a bit as you hollow out your back. Raise your head to look up. Continue the cycle of cat and cow in line with your breath. 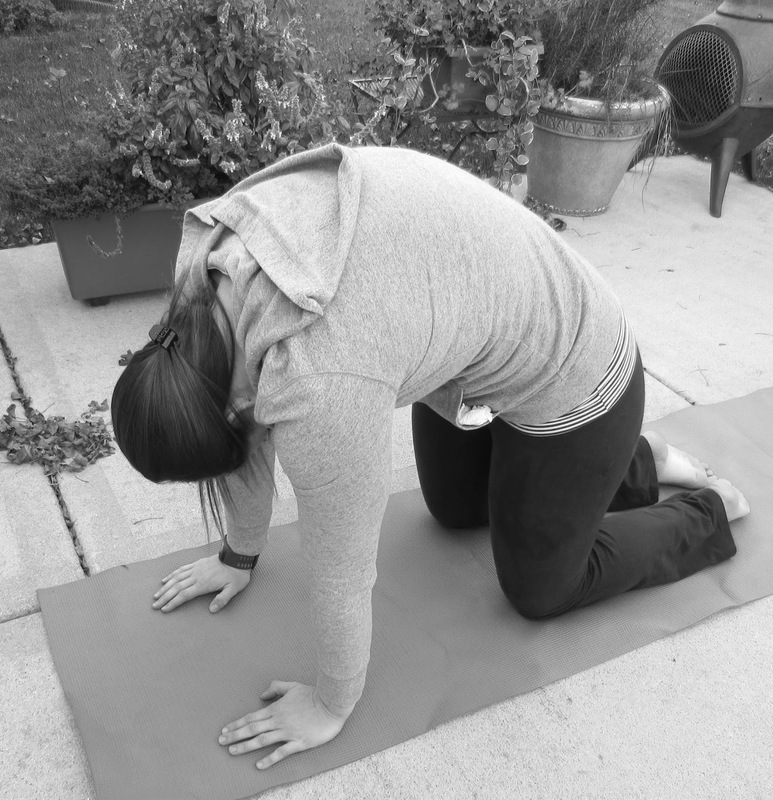 Child’s pose: this is another stretch for the back. 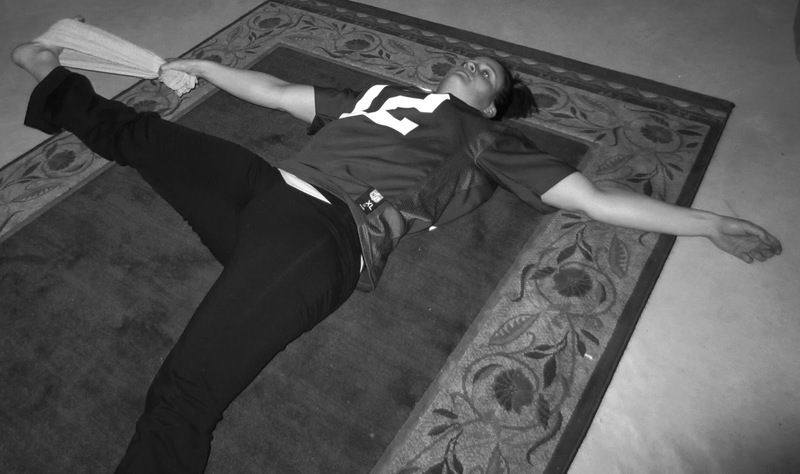 It allows you to relax and stretch the lumbar spine. Knees should be at the edges of your mat with your big toes touching. Sit back onto your heels and stretch your hands out in front of you. You can also move your hands to one side to include a side stretch. 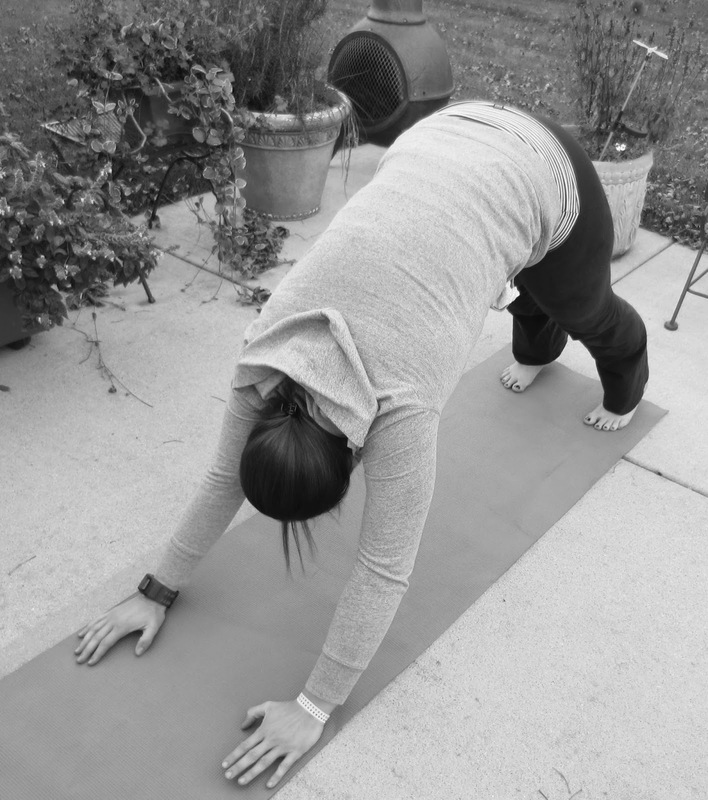 Downward dog: this pose will stretch and strengthen the back and hamstrings and help improve circulation. Laying on your stomach, you are going to curl your toes under and raise your hips. Think about trying to push the crown of your head towards the mat, relax the neck and shoulders and lengthen the back. You can also pedal your heels to feel a good calf stretch as well. Low lunge: this will stretch hips, quads and hamstrings as well as strengthen these muscle groups. Start in a lunge position and drop your back knee to the mat. Bring your hands up above your head , breathe and hold the stretch. Take the time this week to think of something you’ve always wanted to try but never did for one reason or another and just do it. Give it a go and you may find that you really like it. It takes thirty days to make or break a habit so give it a fighting chance. I’ve learned that sometimes it takes a couple classes or tries before you get comfortable with the unfamiliar. Allow your body to adapt to it and get used to it before you give up. Who knows you may be running 10Ks and be able to touch your toes if you give it all you got. Posted on October 14, 2013 January 9, 2014 Categories Ashley, FitnessLeave a comment on Giving Yoga A Try!